The Schulich School of Business and York Faculty of Science have partnered to offer a program for high achieving students that provides workshops, networking activities, and guest talks for students who want to explore the option of applying their science degree to a management career. 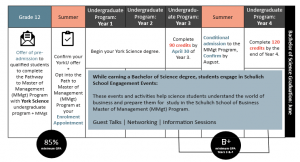 What is the Science + Schulich Pathway to (MMgt) Program? Pathway to the Master of Management (MMgt) Program lets you explore the benefits of a management degree in an informed manner. While you earn your Bachelor of Science (B. Sc.) degree, students gain entry to Schulich engagement events specifically tailored for Pathway to the Master of Management (MMgt) Program participants. What is the Pathway to Master of Management (MMgt) Program? While working on their Science undergraduate degree, students in the Pathway stream participate in a variety of activities at Schulich and, at the end of their 3rd year, are able to apply, and receive early conditional offers of admission to the MMgt program. Successful candidates are eligible to begin the Master of Management program right after successfully completing their 4 year undergraduate program and achieving a B+ average in their last two years of study. Only first year incoming students with a final admission average of 85% applying to York University’s Faculties of Science will be invited to join the Pathway stream. Faculty of Science students will be invited to join upon admission and must confirm their participation in the Pathway Program during their Faculty of Science enrolment advising appointment. Does participation in the Pathway to Master of Management (MMgt) Program, mean automatic admission to the Schulich School’s Master of Management program? No. Enrolment in the Pathway to Master of Management (MMgt) Program does not automatically admit a student into the Schulich Master of Management Program. The Pathway Program is a pre-admission program providing access to a fast-tracked application process. Students will still have a formal application assessed for admission to the Master of Management Program. However, they benefit from a fast-tracked application process that provides early application and assessment prior to other general applicants. They must submit a formal application at the end of their 3rd year of study and will be conditionally admitted to the Master of Management(MMgt) program in the summer before their 4th year. What is the fee for participating in the Pathway to Master of Management (MMgt) Program? Students are not required to pay any fees beyond the tuition fees for their undergraduate degree and the tuition for the Master of Management (MMgt) program. Can I opt-in or out of the Pathway to Master of Management (MMgt) Program during my undergraduate degree? Currently, the Pathway Program is only open to students starting in Fall 2019 who are entering their first year at York University. Students outside of the Pathway stream must apply separately for the MMgt program or other Masters program at Schulich. Students may opt out of the Program at any time, simply by communicating in writing their intent to withdraw from the Pathway Program cohort (student group).